This blog originally appeared on Fair World Project. Katherine* wiped the sweat off her brow as she labored under the blistering Kenyan sun, planting 100 new mango seedlings. Katherine lives with her husband, son and daughters on a parcel of land her husband inherited from his father. With the decline of the cotton industry a few years prior, her husband had decided that the family should begin cultivating mango trees. In the semi-arid Machakos County of Kenya, there were few other options that the family could consider for a cash crop. Nine years later, Katherine’s mango trees are now producing the popular apple mango variety, a sought-after variety in the fresh export and domestic market. In addition to tending the subsistence crops her family depends on for food, she spends her time taking care of the mango trees: applying fertilizers and pest control, fending off animals, and harvesting at the season’s end. Despite her efforts, Katherine is not able to enjoy the fruits of her labor at harvest time. In Katherine’s community, men are customarily viewed as the land and farm owners; as the owners, they can decide what gets planted, what the crop is sold for, and how that income is used. Her husband arranges a sale with a buyer and pockets the proceeds. Though he tells her that the money has been deposited into their shared bank account, she finds only a small amount there. Although he does not say it directly, she is quite sure he has squandered most of her hard-earned income on a popular drug, khat. Katherine’s experience is not unique. Kenya’s constitution recognizes equal rights to land and property for women. In practice, however, women have weaker rights to land than their male counterparts. And why does this matter? Strong rights to own, use, control and transfer land can empower a woman within her household, giving her a greater say in decision-making, such as over how to spend proceeds from crops grown on the land. Katherine’s experience is also not unique to Kenya. In too many places, women’s claim to the land they rely on for food, income and shelter is through their relationships with male relatives. Even when laws recognize gender equality, customary norms and practices can entrench upon women’s insecure land rights. This gap between policy and practice continues to drive gender inequality in many parts of the world. Closing the gap could have major implications for post-harvest food spoilage, which reduces the incomes of smallholders like Katherine and adds pressure to food systems that are already overextended – indeed, more than 40% of fruits and vegetables in developing regions spoil before they reach the table. As part of its YieldWise Initiative, the Rockefeller Foundation is addressing post-harvest losses across four value chains in three African countries (Kenya, Tanzania and Nigeria). 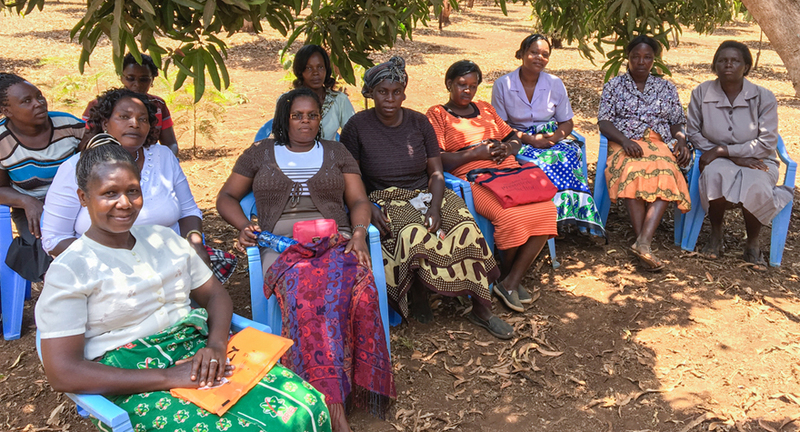 In Kenya, the initiative is working with mango farmers to help reduce food losses by at least 50% to help farmers achieve more sustainable livelihoods. Through the YieldWise Initiative1, Katherine recently registered to participate in a new program to learn additional skills in pesticide application, harvesting techniques and post-harvest storage. The program also promised to connect her to new buyers and teach her about credit options. Katherine hopes that, with the new skills and opportunities she gains through the program, her family can use the increased income to purchase an irrigation tank and pay for her children’s school fees. In conversations with Katherine and women like her, it is clear that many women believe the YieldWise Initiative is helping mango farmers like them understand how to use pesticides and gain access to buyers. But they also articulate that there are some underlying challenges and structural barriers that need to be addressed for them to fully take advantage of the initiative. It is not only married women like Katherine who feel the impacts of structural barriers like insecure land rights. As women’s rights to land are dependent on male relationships, those rights may be vulnerable when those relationships change. In some communities where there are stronger customary rights for widows to inherit plots of land held in their husband’s name, widows reported that mango sales were an invaluable income source to support their households. Where such provisions for widows do not exist, however, women reported being chased off the land (often by brothers-in-law) after their husband’s death – denying them a critical asset for earning a livelihood. In an assessment commissioned by the Rockefeller Foundation to better understand how land-related challenges could impact YieldWise Initiative implementation, Landesa identified insecure land rights of women as one of the biggest risks the initiative should consider. implements a participation quota to ensure the participation of women in project activities. Some conscientious buyers will require multiple members of the household to be present at the point of sale; others have worked out informal arrangements with several families to make mango payments directly to the children’s schools, sometimes by setting up installment payments. As one implementing partner noted, greater empowerment in household decision-making could help women like Katherine to finally enjoy the fruits of their labor.